Real Men Don’t Eat Quiche. Real Programmers Don’t Write Pascal Real Computer Users don’t use WIMP interfaces (that’s WIndows, Mouse, Pointers for the uninitiated). So, a command-line interface to Google is a must! So Goosh is there !! Google shell with tab completion and history. I wish it gave more options, though, to set preferences like how many items returned per query, and the ability to mix -l (lucky) with i (image). I tried a sudo gedit, but it didn’t work. Absence of calculator. heavy use of AJAX. and few more stuffs are missing. Overall : Intelligent uses Telnet for same. 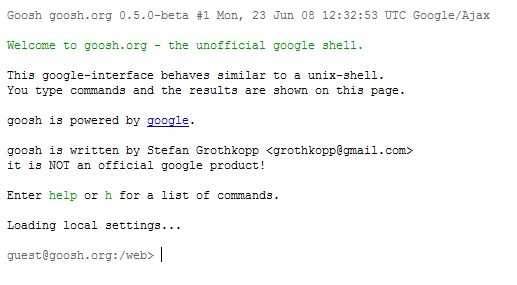 But the Comand line Interface of Google is must and that is made by Stefan Grothkopp with Google code. Its worth to visit !! Wow, that’s awesome. I might give it a try, but I think I am too acustomed to the GUI of Google Search instead. Didn’t know about this before.